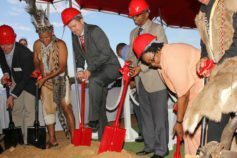 Construction of the R2 billion Kouga Wind Farm at Oyster Bay is on track with work teams upgrading access roads and casting foundation bases for the 32 turbines. When operational in the final quarter of 2014, the wind farm will generate 80MW of clean and renewable power. 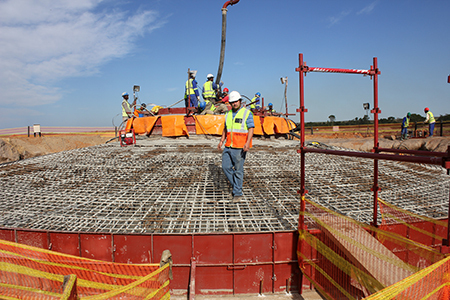 According to Pieter Taljaard, the site construction manager, 12 of the 32 concrete bases each of which is 20m in diametre to support the 80m high turbines, have been cast. “Progress has been very good with the weather being very kind to us. 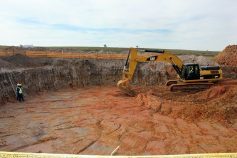 Work is generally on track and in some instances even ahead of schedule,” said Taljaard. Shipping of the turbine equipment and parts will take place between December 2013 and May 2014 with the delivery and erection of the turbines scheduled to take place between February and September 2014, depending on the weather conditions. Work has also started on the wind farm substation and is progressing well, while the electrical long lead items and switchgear have been ordered and will be installed during the first half of 2014. Eskom is responsible for the electrical grid connection and overhead power line to the Kouga Wind Farm, and is on track to ensure the June 2014 grid connection date is met. 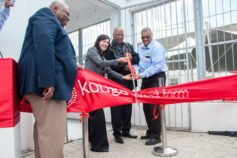 “Individual turbines at the Kouga Wind Farm will join the grid in June 2014, with the full 32-turbines being operational by December 2014,” said Kouga Wind Farm project manager Chris Els. A defining feature of the Kouga Wind Farm is that it far exceeds the new minimum threshold of 2.5% community participation set for each Renewable Energy Bid. 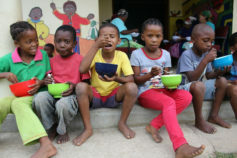 The Kouga Wind Farm Community Development Trust holds a 26% shareholding in the project company and will derive income from the sale of electricity to fund health, welfare, education, local infrastructural and enterprise development projects. Donated food parcels and blankets to the Sea Vista families in St Francis Bay who lost their homes when a fire broke out on Sunday 28 July 2013. 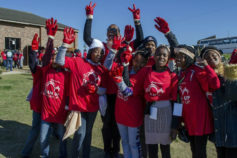 In a joint initiative with Power Construction the KWF team provides a free clinic transport service from the Oyster Bay community hall to the clinic in Humansdorp. “The wind farm is working closely with the Kouga Municipality and the local community to identify further areas of need in the area, as well as to plan its CSI initiatives in preparation for the operating phase. Once the wind farm is commercially operational the wind farm’s investment into the community, as well as that of the community trust will increase exponentially” said Mark Tanton, a director of the wind farm.